The results of the hard-fought election campaign that have held the interest of the German nation for weeks have been announced, with a stunning and surprising victory for the Free Conservative Party. Organised as an outgrowth of the DZP and EP voting block following the 1937 Elections, the Free Conservatives represent a union of centrist and right-of center interests, and there is no question that the financial scandals that have rocked the DVP and SPD coalition in the last months heavily influenced the outcome of the election. Running on a platform of reform and economic development the Free Conservatives have achieved what no party has accomplished in the history of the Republic – an absolute majority of seats in the Reichstag. President Eckner has called upon the leader of the Free Conservatives, Konrad Adenauer, to form a government. Herr Adenauer accepted the mandate and promised to name his cabinet shortly. Police were called to the Hotel Bristol in the early morning to investigate the suicide of Generaloberst Ernst Udet, commander in chief of the Luftwaffe. Papers found in the possession of the deceased were sequestered by the public prosecutor as material evidence in the so-called Aerobank Affair, investigation of which is ongoing. Udet’s name had been linked to reports of financial irregularities in Luftwaffe procurements, and it has been suggested that his suicide is in some way linked with the scandal. The Cabinet Office of the Chancellor has provided the following list of appointments to the Cabinet. The Cabinet Office also announced that the current Air Ministry would be abolished – its functions with regard to the Luftwaffe would be incorporated into the Ministry of Defence, while its function with regard to civil aviation will be transferred to the Ministry of Transport. Ireland: Taoiseach DeValera extends his congratulations to Herr Adenaur and his new cabinet. Bulgaria: Tsar Boris extends his congratulations and will free his schedule to attend any sort of swearing-in ceremony. The Latvian Ambassador to Germany presents Herr Adenaur with a bottle of the finest Latvian Kvass. Prime Minister Neville Chmaberlain sends a congratulations telegram to Herr Adenauer and his government on their electoral victory. The Royal Aero Club sends a condolence telegram to Generaloberst Udet's family. A great and highly skilled pilot has been lost to us this day. Argentina's President and Prime Minister also send congrats to Adenauer and a delivery of highly tasty prime Argentine corned beef too! King Carl XVI Philip of the Nordmarchian Empire extends his congratulations to Herr Adenaur. The German Academic Exchange Service (Deutscher Akademischer Austauschdienst - DAAD) announced that following an in-depth review of its finances by the Cabinet Office the Government will allocate an additional ten million marks to expand the activities of the DAAD and provide widening opportunities for scholars from around the world to study in Germany. The additional funding will allow the DAAD to extend its grant program to Argentina, Brazil, Chile, Colombia and Peru – countries whose scholars were hitherto unable to apply for research grants under the DAAD guidelines. Up to fifty scholars from each of these nations will be eligible for acceptance under the DAAD’s competitive, merit-based rules. Speaking to a packed crowd at the works' auditorium, Herr Heinz Nordholl, Commercial Technical Director of Auto-Union, unveiled today the firm's latest offering for the motoring public - a small, simple, reliable automobile intended for the common German citizen. 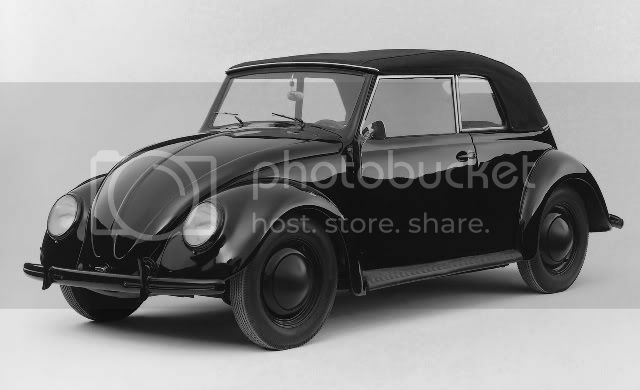 "The German people," Herr Nordhoff said, "deserve an automobile that common people can afford. A car for the people - A Volkswagen". With those words he unveiled examples of both a sedan and a stylish cabriolet. The work of Auto-Union designer Erwin Komenda, the new vehicles will be available for delivery in the spring of 1940, with the projected price of Rm 1,300. Russian market would be interested, if distances between cities were smaller. Even Russia hasn't enough oil to build adequate road network. Rails and waterways are only feasible/affordable solutions. Russian automotive industry mainly builds trucks and busses. The German auto industry is quite willing to respond to Russian needs for commercial and cargo vehicles. Would a delegation to discuss such be received? Alternatively, a Russian delegation would be quite welcome to tour German vehicle-manufacturing facilities. Designer: "I give you the FUTURE of Toyota!" "... but for now, we're stuck with building these..."
... and Toyota's a survivor just like the Volkswagen, having come into existence at about the same time. Delorean didn't even last a decade. Shiny but crappy and now extinct like the Dinosaurs. Acctually the DMC-12 wasn't that bad of a car, just not special enough for the day. Its neato stainless steel body panels made it difficult to paint and made fingerprints stand out like a soar thumb. It was also abit pricy for what you got, with other similarily priced cars being much better with performance and options. Since when has Belfast been Canadian????? Probably around the time I took over White Star Line, and gave Olympic to Belfast as a memorial. The Office of the State Prosecutor has announced the indictment of Erhard Milch, former State Secretary of the Air Ministry, on charges of peculation and official misconduct. Sources suggest that the indictment is an outcome of the ongoing investigation of the Aerobank Affair and may be but the precursor of others to follow.